According to theknot.com, the average wedding now costs $27,800, but this includes those “lucky brides and grooms who get $40,000-and-up weddings thrown for them” so it brings up the average. Holy schnikies, that’s a lot of dough! Having just paid for our own modest wedding, I can’t imagine what the brides and grooms in the $20K and up range are spending their money on. As stated before, I was a frugal bride and in order to practice such frugality, Darrin and I did a lot of the work for our wedding ourselves. One way we cut major expenses was on flowers. Also according to theknot.com, a bride and groom can expect to spend 8-10% of their budget on flowers. So for those of you keeping track, that’s roughly $2,200 – $2,800 (rounding to the nearest hundred) on flowers for the “average” wedding. Yowzers! We decided that 8 – 10% of our limited budget was too much to spend on an item that we felt was a luxury. While flowers are exceptionally beautiful and add a lot to the decor, we felt we could create the same ambience with less expensive items. For instance, we used a number of candles for centerpieces at the reception and placed throughout the chapel. One area, however, where a florist really comes in handy is creating boutonnieres and corsages for wedding attendants and other guests of honor. This is where I decided to get really crafty and I DIY-ed these items using artificial products so that I could reduce stress by making them well in advance of the wedding. I had pinned a number of inspiration photos such as this one, this one, and this one and had those on my iPad next to my workstation for easy viewing. I purchased my supplies from Joanne’s including feathers, seashells, corsage pins, floral wire and spray paint in silver and blue. At home I already had ribbon, wheat, floral tape and stems, electricians tape, and hot glue. First, I prepped the wheat and seashells by spray painting them blue and silver, respectively. The shells came out more of a muted gray which worked out just as well. I left these items out to cure in the sun for at least 24 hours. I then hot glued each shell onto a floral stem. After all items were prepped, I gathered up the rest of my supplies and started to experiment. I quickly decided that I did not like the look of the wheat – fail #1. I also found that the floral tape did not play nicely with the feathers. The glue from the tape left a sticky residue on my fingers that transferred to the feathers and severely disturbed their shape and design – fail #2. I gave up working with the floral tape and hunted around for an alternative. I needed something dark that would camouflage behind the color of the ribbons and blend in with the feathers. Aha! Electricians tape. I had it on hand and plenty of it. Then I experimented with the different elements at hand. I chose a feather or two, arranged it with a sea shell, wrapped tape around all of the items and finished it by wrapping it in a ribbon and tying it off in a bow. 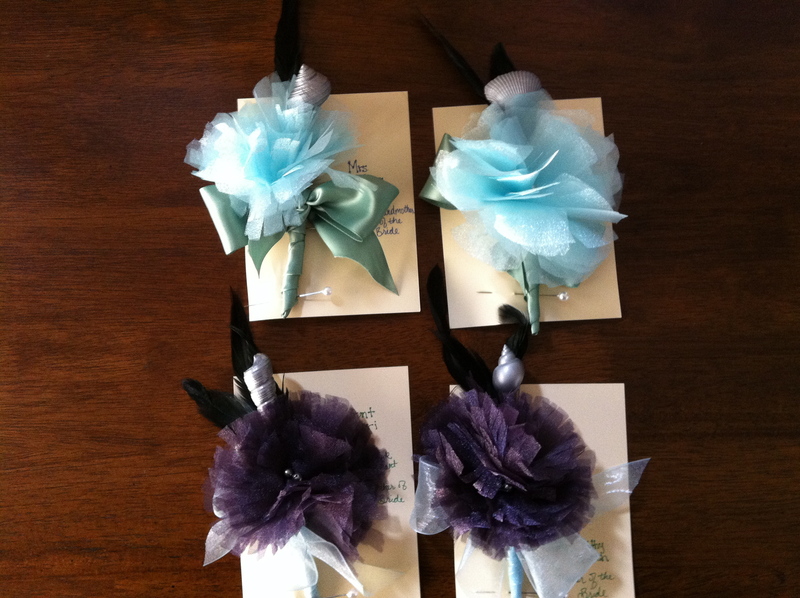 I then attached each boutonniere to a card with the corsage pins. 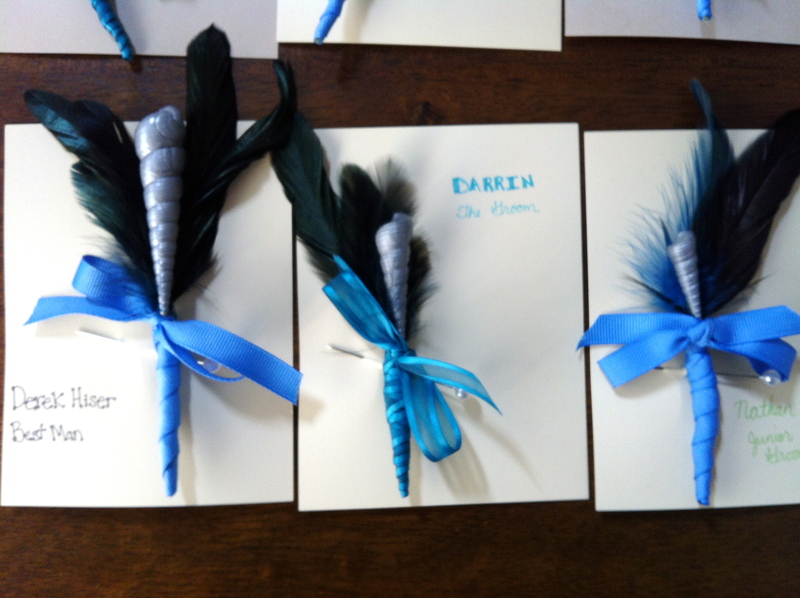 The finished product: the groom’s boutonniere, as well as his brother’s and nephew’s. A cool feature with the shells was that I was able to vary them while playing a match game amongst family members. For instance, both Darrin’s and my nephews were in the wedding along with their fathers. So, the seashells in the young boys’ boutonnieres matched those belonging to their dads’. Boutonnieres in action! It’s hard to overlook the adorable ring bearers in this photo, but if you try, you can see two of the boutonnieres in action…not too shabby. For the corsages, I learned to make fabric flowers by following the tutorial found here. I had leftover fabric from another wedding project (more on that later). I also went through my jewelry and selected a couple of old necklaces to scavenge for beads. I stitched three beads to the center of each flower to create a stamen. The father of the bride and mother of the bride lapel-wear. I stitched floral wire to the back of each flower making sure to line-up the center of the wire with the center of the flower. I bent the wire in half and twisted it to create a stem. I also reinforced the wire by wrapping electricians tape (my new favorite tool) around it. There is probably a more effective way to create a stem for a fabric flower, but I didn’t realize I needed a stem until after I made the flowers, so I had to get creative. 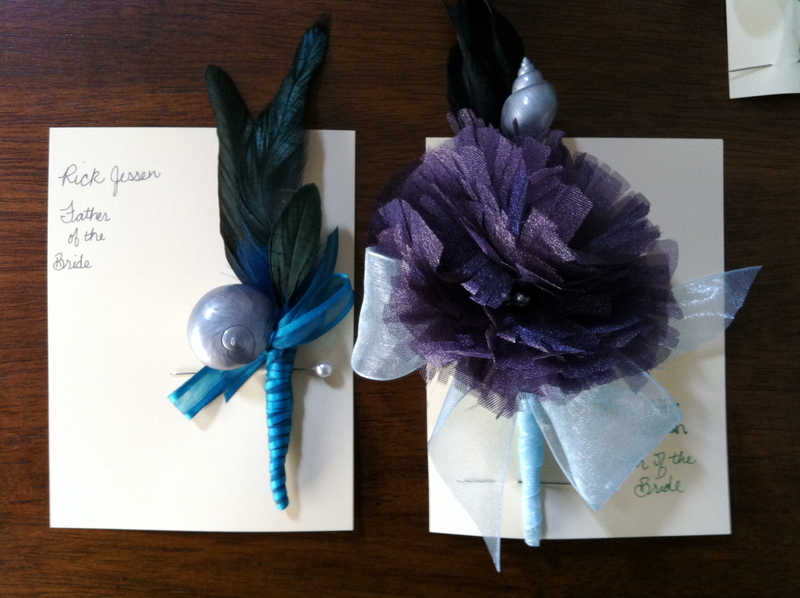 I selected a feather and seashell to arrange with each flower to create a corsage that complimented the boutonnieres. After all the items were arranged as I wanted them, I secured them in electricians tape and wrapped that in a ribbon which I tied off in a bow. 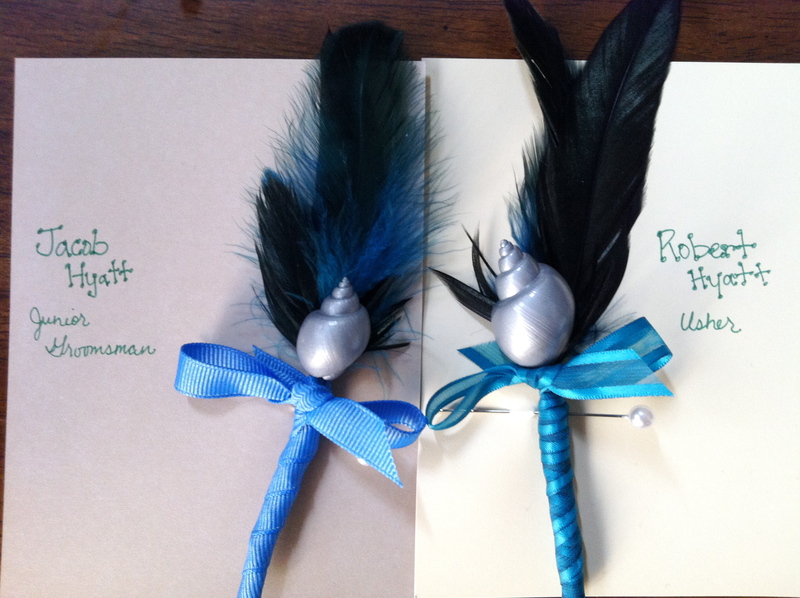 Like the boutonniere, I attached the corsage to a card with pins. All in all, I spent a solid day working on this project but I saved a ton of cash. Below is a list of my supplies and expenses. I found estimates ranging from $5 – $15 for fresh flower boutonnieres and corsages through google searches. So, I feel pretty good about the savings we generated (even with my mistakes) and I even created some souvenirs for our wedding attendants and special guests. What do you think? Have you ever saved big bucks by getting creative? Did things turn out as you expected?